Pro killer man is a puzzle/action game where you play as the famous "man in suit". 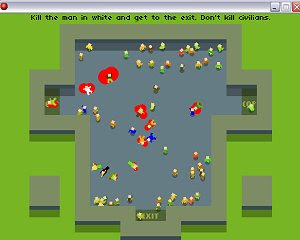 Your goal is to kill the men in white while avoiding cops and bodyguards. 10 challenging levels full of exciting situations, semi 3d-graphics, and a stunning plot!